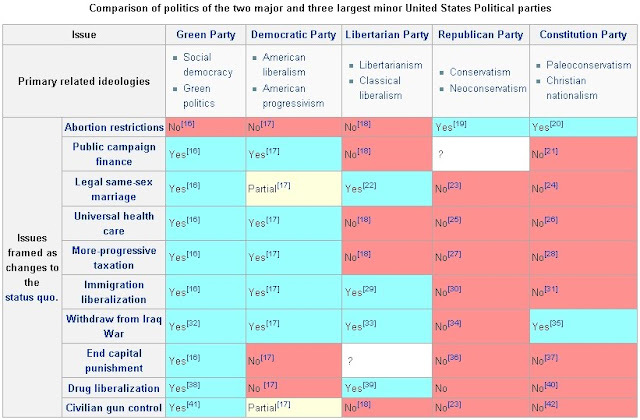 I was going to create my own political party matrix to outline the various party platforms, but while surfing Wikipedia, I had noticed that they had already made one for the two major political parties and the three minor political parties. Because they had already created one, I figured I would post it on my website for all to view. The reason why I want to put this up there is because I would like people to question their political affiliation, whether it be Democrat or Republican. Watching these Tea Party protesters, or angry town hall patrons, it makes you wonder how many of these people actually know what it is they claim to be. I had for years been registered a Republican, but I did not associate myself with the party, for I voted for the person. At the time, I registered with the Republicans because they embodied many of the ideals I was looking for in a candidate, even though I disagreed with many positions they take. I had also registered so that I could partake in the primaries. Recently, I have decided to change my party affiliation, and have narrowed down the choices between the Democratic Party, the Reform Party, or the Libertarian Party, although I still question as to whether I should remain as a Republican to use my vote to help prevent the party from giving representation to the fringe.